Written by Phill Bates ( St George Cycling Club ) Friday 25 June 2016…. On a more sombre note, I attended the memorial service of Jim Walton today. Jim was known as Gentleman Jim, was a police officer for many years and his main post was Mortdale Police Station. 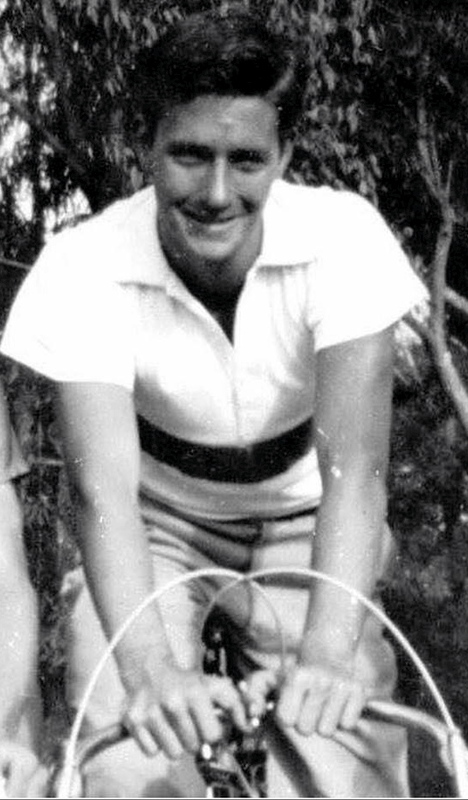 The most notable aspect about Jim is that he was one of the club’s first ever national champions, combined with the Late Barry Thew and our wonderful friend Ron Webb to win the Australian Southcott Cup (teams pursuit) in 1953. He also finished second to Commonwealth Games champion and future Olympic champion Ian Brown in the 10 mile National Title but won the return bout in 1955, winning the National 5 mile title at Hurstville Oval in 1955. Jim was one of our early stars – the start of a multitude of many National, Commonwealth Games and Olympic Games champions and I was honoured by his wife Elaine and sons Bruce and Rob to speak at his memorial service at Engadine today. Born and bred in St George territory, living in Peakhurst before spending the last of his 20 years in Kiama, after having a stroke. Jim was a champion in many ways…. Photo courtesy Harry Willey family collection. I commenced training as a Junior Trainee at Redfern Academy on 12 January, 1981. My training Sergeant was Sgt Jim Walton. I have cropped a picture from my class photo. I will always remember my introduction to the NSW Police as a positive and welcoming experience.